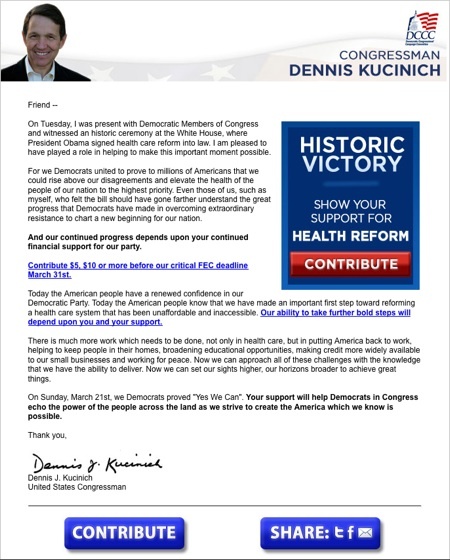 Here's something you don't see every day: A Democratic campaign committee not only embracing Rep. Dennis Kucinich, D-Ohio, but using his name and image on a fundraising appeal. On Wednesday, the Democratic Congressional Campaign Committee e-mailed supporters a letter from Kucinich touting the healthcare reform bill that President Obama just signed into law and asking for donations. You can see a screenshot of the e-mail below. I've been on the DCCC's fundraising e-mail list since September of last year (I'm signed up for the lists for all of the party campaign committees on both sides), and this is the first time during that period that they've used Kucinich's name in an appeal like this. Indeed, it's rare that a message will go out under the name of a House Democrat other than Speaker Nancy Pelosi or DCCC Chair Chris Van Hollen. The rare exceptions are fairly big names like Rep. Barney Frank, D-Mass., and Rep. Debbie Wasserman Schultz, D-Fla.